Whatever you think you know is subject to change at my whim. I will not be contained by my news feeds and online purchases, by your complicated algorithms for simplifying a man. Watch me break out of the hole you put me in. I am a man, not an animal in a cafe. Goddamn auto correct. I wrote back immediately. Dr. Paul C. O’Rourke, D.D.S., is a brilliant dentist but a troubled human being. Searching ceaselessly but fruitlessly for “something” that might be “everything” — God, kids, the gym — his existence is nonetheless dominated by office life and Red Sox games. 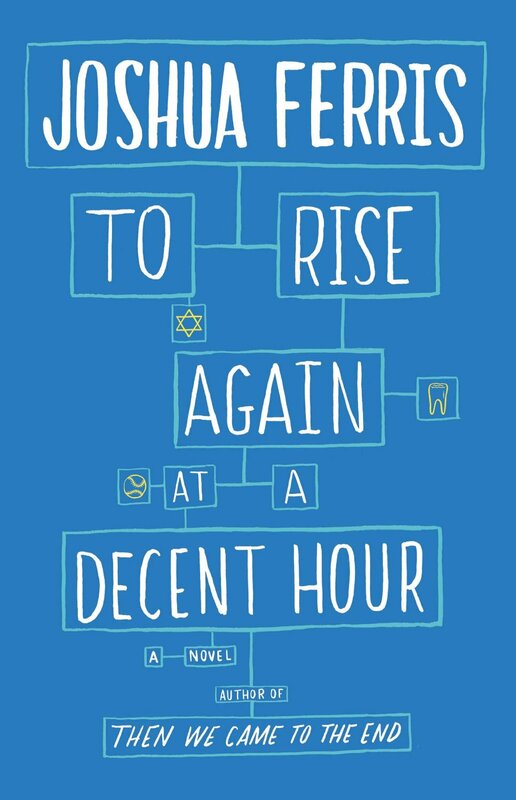 Joshua Ferris, whose Then We Came To The End won the PEN/Hemingway Award for best first novel, has scored another home run with the excellent, vaguely disturbing satire To Rise Again At A Decent Hour (Little, Brown, 2014). One day, one of Paul’s patients tells him on his way out the office that he’s off to Israel. Not because he’s Jewish, he says, but because he’s an Ulm — “and so are you!” Not knowing what an Ulm is, and concluding wearily that “gas makes people say funny things”, Paul forgets about it. Six months later, though, when a website for his dental practice appears online accompanied by ominous biblical-sounding quotations and further references to the Ulms, he begins to suspect that the man headed for Israel might have something to do with it. Then come comments on New York Times stories about Israel and Palestine, including mysterious references to “the Cantaveticles”. Soon after, Paul discovers a Facebook page and a Twitter handle in his name. (@PaulCORourkeDental is crying out to be activated for real, by the way — thank me later, Little, Brown). Deciding to track down whoever’s behind all of this, he finds himself colliding with a canny billionaire and the curious romantic history of his digital antagonist. To Rise Again is a brilliantly funny satire on religion, masculinity and the construction of meaning in the digital age. It takes contemporary frowners like online identity theft and atheist’s angst and adds a Borgesian twist. Has this crumb of apocrypha — the Ulm experience — fallen from a much mightier loaf? What happens to authority when anyone can set up a Twitter account in your name? (There are some ninety Josh or Joshua Ferrises on Twitter, incidentally, none of whom wrote this book.) And in Paul’s own words, to the rare book dealer he enlists to help him track down textual evidence of the Ulms, “how many people does it take to make a thing like this real?” The internet — and in particular social media, which Paul has long tried to avoid — is used to occasion a semiotic crisis for our indignant hero, who knows neither what to believe nor whom to trust. I really only wanted to be smothered in the embrace of an inclusive and coercive singular “we.” I wanted to be sucked up, subsumed into something greater, historical, eternal. One of the unit. One with the clan. In this he finds a counterpart in his avatar-thieving assailant, who ultimately makes a sort of religion out of doubt. Could this be the sort of religion to finally ensnare Paul? The city had almost nothing else to offer, and if this great city had almost nothing else to offer, imagine what it was like in lesser cities, or the suburbs, or the small rural towns where so many people are clerks and farmers, and you will understand, finally, why this country has become a nation of fat alcoholics and the nurses and therapists who tend to them. […] We are consuming ourselves alive as our physical grotesqueries grow in direct proportion to our federal deficits and discount gun shops. To Rise Again At A Decent Hour is a sharp take on the difficulty of spirituality in the digital age. Check it out at McNally Jackson here. ← Can The News Make Us Better?